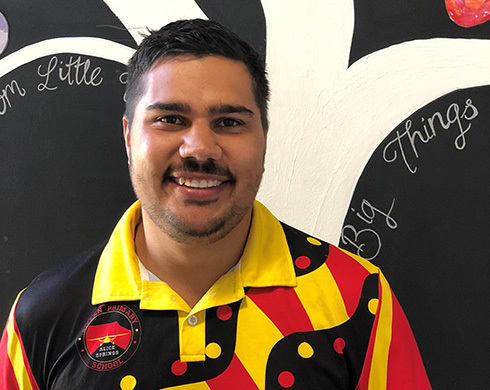 The 29-year-old Arrernte man, and Gillen Primary School teacher, is described by Donna O’Brien — principal of the Alice Springs school — as “passionate about making positive long-term changes in the lives of his students”. “Matthew is strongly engaged with School-Wide Positive Behaviour Support,” she said. “He provides innovative ideas to make sure students learn behaviours that will help them succeed at school, and ensures students receive acknowledgement when they behave correctly. “Matthew is one of those staff members who is aware when his colleagues are struggling, and will step up to offer a hand. Matthew, who has been teaching at the school for five years, has a vision for the development of the school and its students. “I’m very keen to continue building literacy and numeracy, and to increase the involvement of the community in the school, especially that of parents,” he said. Matthew believes the Young Aboriginal Educator of the Year Award resonates strongly with Aboriginal educators. “It affirms their position as role models for other Indigenous teachers and students, and symbolises their potential and talents,” he said. Matthew was nominated for the award by Year 6 teacher Lauren Wapling.